We’d love your help. Let us know what’s wrong with this preview of The Escape by Steven A. McKay. It’s spring, 1323 AD, and John Little, notorious outlaw, seeks to forget his troubles in a Barnsley alehouse. He didn’t count on the place being packed to the rafters with drunk, belligerent, Scottish mercenaries though. This new stand-alone Forest Lord tale sees one of England’s favourite sons in a battle for his very life that will hugely entertain all lovers of action and adventure! 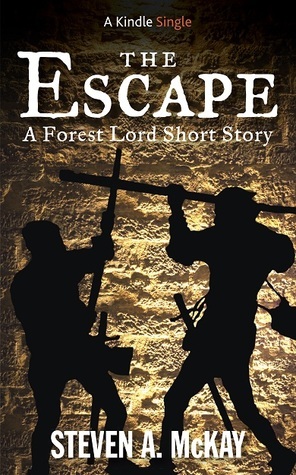 To ask other readers questions about The Escape, please sign up. A great short story allowing Little John to take center stage. Little John has been my favorite character in The Forest lord series. This book take place in-between book 2 and 3 of the series. After Robin's victory in the last book The outlaws have had a little time to relax, and enjoy themselves, however Little John is probably the easiest to spot of the outlaws, and attracts some unwanted attention. John right from his name is known for his size, but this book allow him to display his skills, A great short story allowing Little John to take center stage. Little John has been my favorite character in The Forest lord series. This book take place in-between book 2 and 3 of the series. It’s a short tale at 19 pages but does offer an action packed little tale to read. The plot is really good and it was a really nice change of focus Robin not being involve So this is a super short fun tale that fits in with McKay’s Forest Lord Series. It slots in nicely between books 2 & 3 so I’d advise not reading this until you’ve finished book 2 at least. It’s a short tale at 19 pages but does offer an action packed little tale to read. The plot is really good and it was a really nice change of focus Robin not being involved. Little John gets to show how much of a formidable opponent he is and the image McKay paints is spot on with how I’d imagine the character myself. A delightful short featuring John Little or Little John as he is more famously known as. A night out with friends, lots of ale and food, and a group of mean looking mercenaries bent on mayhem. A pleasant night goes awry but have the mercenaries taken on more than they can handle? An imaginative bit of writing at the end had me thinking, "clever, Mr. McKay, very clever indeed." What can I say, Steven, I know there is one more novella to come but I kind of miss Robin Hood and the team already? I enjoyed this very much and a great diversion while we wait for the last book, what I love about the books especially the novella is they give a story to all the characters that the life of Robin Hood, I look forward to the new books you are writing and I look forward to hearing the Forest Lord series on audio. Brilliant addition to the Robin hood series which Mr mckay has created. This is a very short story and I mean short, you can read it in about twenty minutes, but it is very good. Recommended. I was born in 1977, near Glasgow in Scotland and live in Old Kilpatrick with my wife and two young children. After obtaining my Bachelor of Arts degree I decided to follow my life-long ambition and write a novel. The Forest Lord series now has four novels, and various short spin-off tales. My new book "The Druid" is the first in the Warrior Druid of Britain series. Next I will be finishing off my s I was born in 1977, near Glasgow in Scotland and live in Old Kilpatrick with my wife and two young children. After obtaining my Bachelor of Arts degree I decided to follow my life-long ambition and write a novel. The Forest Lord series now has four novels, and various short spin-off tales. My new book "The Druid" is the first in the Warrior Druid of Britain series. Next I will be finishing off my standalone novel which follows a slave in Roman Britain - that one is completely different to anything I've written so far! I play lead/acoustic guitars and sing in a heavy metal band when we can find the time to meet up.